Here’s the results of an experiment into building dynamic SVG for direct viewing in web browsers. If you want to see the animations just click here or here. The hands animate and the time on the clock should be correct for your time zone! 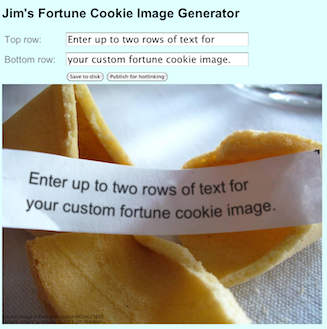 Building on from the fortune cookie generator I build last month, I wanted to build in interesting new SVG demo to showcase what you might call ‘live Photoshopping’; generation of custom photo realistic images. 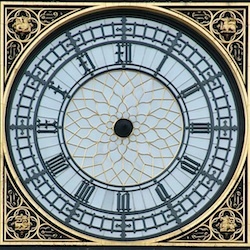 It seems traditional to make a clock when learning SVG, so I played on this idea a little with a plan for a photorealistic, animated image of Big Ben. The hands were to move in real time and show the correct time for the user’s browser. 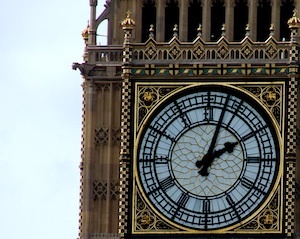 Big Ben (more pedantically titled the Clock Tower at the Palace of Westminster) is one of the most famous clocks in the world. 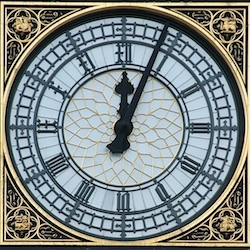 Its an iconic symbol of my home city London; so what better clock to chose for the animation. As often with these projects the job began with a search on Flikr for high quality images with licenses permitting remixing. I found two great images, flickr.com/deerhake11/3903926815 flickr.com/aldaron/536362686 Many thanks guys for the great images and for putting Creative Commons licenses on them. Next step was to fire up PhotoShop and begin the process of removing the clock hands and shadows. Before and after pictures are here. Then the same tool had to be employed to recreate the hands as assets that could be overlaid and rotated to show the correct time. All done, I used Inkscape to help me line up all the images and try out various filter effects to recreate a subtle shadow on the clock hands. Once I was happy with the results I built up my own SVG file and added the scripts to animate the clock hands. One problem that needed solving was that the animation shouldn’t be shown as its child images were being downloaded into the browser. This resulted in a weird effect where the user would see the image being built up from the constituent elements and the illusion would be spoiled from the beginning. Sadly I couldn’t find an SVG equivalent of window.onload to delay code execution until the whole image was ready. My workaround was to include the child images as base64 encoded inlined data which ensured as a side effect that all assets would be available at the same time. There may be better workarounds if I had the inclination to investigate. Because the drop shadow effect uses SVG filters, the image won’t look as realistic on browsers that don’t have full SVG support. These include Safari and Internet Explorer 9. Earlier version of Internet Explorer don’t support SVG at all, nor, weirdly, does the Android web browser. Here are both links again. I’ve always enjoyed playing with meme image creation tools such as saysit.com and many others. When I couldn’t find a creation tool to make fake fortune cookie images I decided to build my own. It would also give me a chance to play with some HTML5 technology I’ve been looking at, specifically SVG images. Once I found a suitable fortune cookie image on Flikr (an excellent image from Flikr user cpstorm), and checked it had the right license (Creative Commons for modification) I merely had to remove the existing slogan on the image. Easy right? As it happens, Photoshop’s Content Aware Removal tool does a brilliant job at this kind of thing, and the operation barely took ten minutes. I then used Inkscape to make an SVG file that featured the image, plus a template for the replacement text. This involved picking a suitable font, laying down a path for the text based on the existing slogan, and carefully selecting a filter to get the ‘blotter paper’ look. I was pretty pleased with the results, if feel the results are almost photorealistic. I simplified the SVG file as much as possible (Inkscape is excellent but it does include some redundant data that can be removed by hand). So to support these browsers, and to allow the image to be saved as a .jpg file, I really needed the ability to generate the JPGs on the server side. It turns out this is very hard. I looked at ImageMagick which my web host supports. Unfortunately none of ImageMagick’s supported SVG engines has text paths, so the effect would be impossible. In the end I discovered Batik which is a superb Java-based SVG engine with transcoding abilities. The only problem is my current web host doesn’t support Java, and another option Google App Engine wouldn’t work because Batik uses multiple threads and App Engine does not allow that. I looked at options and found an inexpensive Java host just for this application, and purchased a three year package. This allows me to support all browsers, but use client rendering on Chrome, Firefox and Opera for a better experience. The Java servlet uses Batik to generate JPGs from the same SVG used to build the images in browsers, with the custom slogan passed on URL parameters. I also wanted to provide a great image hotlinking service that was as easy to use as possible. It wouldn’t be ideal to try to allow hotlinking on the generator site for a number of reasons, but since there are tons of image hosting sites out there for this kind of thing, the best thing would be to integrate with one of those. I’d seen something called ‘anonymous sideloading’ from an image site called imgur.com, and this proved to be ideal. With one click I can load the images directly onto imgur via users’s browsers. The only tough bit was the restrictions that imager was putting on characters in the source image URL; specifically imgur’s side loader didn’t like the & symbol or spaces. I needed to rejig the generator to take all the parameters as a single Base64 encoded JSON object. This made the URLs imgur friendly and the image hosting setup works a charm. Hope you enjoy the generator at http://jim.ignitiondomain.com/fc! 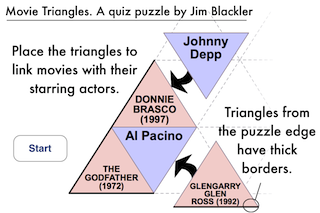 Movie Triangles is a puzzle game that combines a movie knowledge quiz with a tile puzzle. The objective is to fill a 16 or 25 piece grid with triangles containing movie and actor names. 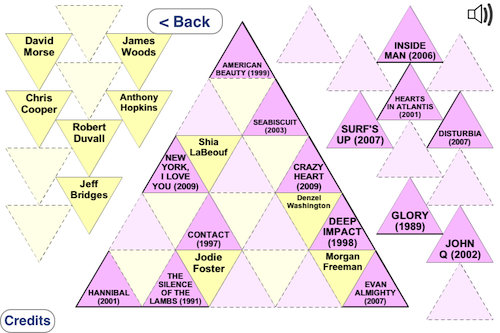 In the winning grid, all triangles with movies will border their starring actors. The game includes a number of puzzles of varying difficulty and featuring movies from different eras. And if you want to know how the game was developed, read on. I’ve long thought that the network of relationships between Wikipedia articles is a fascinating area and ripe for adaptation into a game. I originally contemplated a game based on a hexagon grid where the player would position hexagons labeled with Wikipedia articles. The objective would be to place the hexagons next to those labeled with names of related articles. However this idea lacked clear rules. It’s not clear to the player *why* the articles would be linked, so it would be unreasonable for the game to seek a right-or-wrong answer. So I looked for Wikipedia topics with clear formal links. I thought about players in sports teams, neighboring countries, musicians in bands, and other ideas. However the stand-out candidate for this treatment is movies and the actors who star in them. There is a huge amount of data to be mined, both on movies and actors. The data is bilateral, actors link to movies in good quantity and vice versa. The topic is interesting for lots of people and relatively international. It’s a great topic for a game. As I explored the idea and worked on prototype game grids it became clear that a hexagon structure with six connections per piece would prove unworkable. It would most likely be impossible to create working puzzles, because the demands of having to find six links per movie or actor. Triangles, with just three links (fewer for those at the edge) seemed much more feasible. 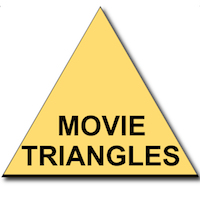 So the design for Movie Triangles was born. The software for the game is divided into three parts, each of which passes data to the next component along. The crawler/scraper is based on my Quizipedia scraper. Written in Java it downloads articles from Wikipedia onto my local PC. An SGML parser is used to load the article DOMs, and XPATH queries are used to pull out data, which is then loaded into a local MySQL database. Using a separate database helps solve problems caused by the large quantity of data (such as serialization) and allows the process to easily be interrupted and restarted. The starting point for the crawl is an article on Wikipedia that is a central list of lists of movies elsewhere on Wikipedia. A ‘list of lists’. Crawling just a depth of two from that hub article appears to cast a net that includes virtually every movie article on the site. Once the pages are loaded and processed they are scanned to see if they are movie articles that can be analyzed for inclusion into the database. Thanks to the diligent work of Wikipedia editors, movie articles consistently have a sidebar that contains structured data about the topic. For my purposes there are two pieces of data that are particularly useful. The first is the ‘Starring’ field that contains links to the starring actors of the movie. Since these contain Wikipedia URLs this provides disambiguation, solving a problem where actors who shared the same name could be confused. Similarly, inbound links to the movies are analysed. Also I use the anchor text from links to provide a cleaner, shorter name than is often provided by the article heading. The other very useful field is ‘Release date(s)’ which can be processed with a regular expression to discover a release year number for the movie. This is useful data for the game to help players identify a movie more effectively than the movie name alone would. It is also useful for verifying and article is actually about a movie. I have also observed that if an article has both ‘Starring’ and ‘Release date(s)’ fields in its information sidebar it is almost certainly an article about a movie rather than something else. This is a very effective filter to ensure a 99% clean data source. It takes only about an hour of running the crawler before a database of about 12,000 movies and actors has been built up. Then the baton is passed to the game builder which begins the process of creating the game puzzle grids. The builder is another Java application which loads the movie and actor data from the local SQL database into memory. It then attempts to construct completed, valid board positions, selecting from all the actor / movie combinations in the database. Firstly a single tile is ‘seeded’ with a particular movie. Then the algorithm attempts to find the valid board positions where the least famous movie or actor is as famous as possible. The reasoning behind the fame requirement is to stop puzzles from being filled with highly obscure movies or actors. If the algorithm used any actor / movie combinations that made the grid fit, it is unlikely that the average player would be able to guess even 20% correctly. It is the nature of Wikipedia that it is highly extensive, but this extensiveness works against the aims of a trivia game. What is needed is some way to score the fame of an article subject. When I developed Quizipedia I experimented with various signals such as the number of inbound links to the article. Eventually I discovered the surprising fact that the length of the article is closely correlated to how likely the average person is to have heard of the article topic. It is an artifact of the fact that the motivating factor for Wikipedia editors to work on an article is also correlated to the fame of the topic. Longer articles mean more famous topics. An relatively obscure actor is likely to have a short article. The actual building algorithm is pretty involved so I won’t detail it in full. The short version is there is a recursive method that takes a position which, for each slot in the grid, has a set of any possible actor/movie that will fit into each slot (this is calculated with iterations of set operations beginning with the currently fixed slots). The slot with the fewest possibilities is selected, the tile is fixed with each possibility is in turn and the method re-invoked recursively until the best solution is found. The builder also creates custom tile images for the game in custom PNG format, with the movie or actor text positioned to fit the triangle using the largest font possible. Having come up with the triangle grid idea, I needed to make the actual puzzle work as a computer game. I went through several iterations, testing on friends before coming up with the design you see today. One main question was how to tell the player if their guesses are correct or not. I wanted the player to be able to move the tiles around freely before submitting their guess. I implemented a ‘check grid’ button that would tell the player if they had it right. Having this only appear when the whole grid is filled helps keep the look simple and therefore inviting. Returning only the invalid tiles allows people to correct their grids and keeps the difficulty manageable. I record and report the number of times the check grid button is used by the player to reward players who found the solution on the first event. Combined with fixing the correct tiles and not allowing players to place tiles in locations already revealed as invalid, it should be possible to solve the grids by trial and error. This lowers frustration levels as players can usually finish grids with a number of attempts. One game element that is controversial with my testers is the tile borders. Here I use a visual clue to show which positions tiles can be found in. This reduces dramatically (particularly with 16 piece puzzles) the number of slots a tile could potentially occupy. People sometimes say this feels like cheating. Certainly it does reduce the simplicity of the puzzle which is regrettable. However in tests I have found puzzles without this aid to be considerably more difficult, to the point of bafflement and frustration. The problem is you may know which actor starred in which movie, but there would still be a large number of tiles both could potentially occupy; maybe anywhere on the grid. If you have a 80% knowledge of the films and actors it can take several minutes of grinding through the possible orientations of the tiles to find the right one. I believe if I had published the puzzle in this way it would only appeal to an elite of puzzle and trivia solvers, who would have the time and inclination to spend the time to work through all the possibilities. Adding the borders means most of the time spent on the game is in thinking about the trivia content rather than wrestling with complex geometric logic. It also allows some interesting logical clues that let you fill in the gaps of your knowledge. I wanted the game to present an inviting, clean layout to the player. The game always completes the corner grid pieces to invite the player to get started straight away; each corner piece has just one neighbour to find. 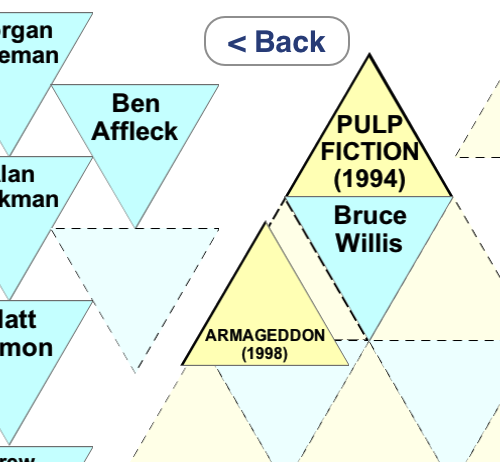 I am pretty happy with Movie Triangles. I hope you enjoy it too. 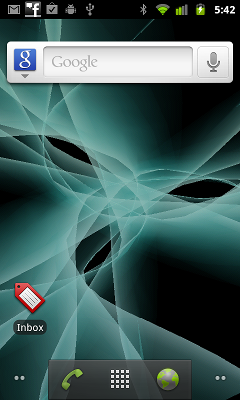 My first Android release (under my own name) for a while is Color Storm, a Live Wallpaper for 2. * Android devices. It creates striking patterns and colors on the user’s Home screen. It took about ten days to put together (as ever in Java under the Android SDK in Eclipse). It builds on pattern programs I have been working on for about 25 years when I used to tinker with plotting vector graphics on the Amstrad CPC. More recently I developed a Windows Media Player visualization around 2000. That effect was heavily dependent on so-called back-buffer effects (modifying and redrawing the previous frame). This allows an animated vector line pattern to be converted into something that fills the screen with color. However on this occasion I wanted to achieve a fuller effect using geometric effects. 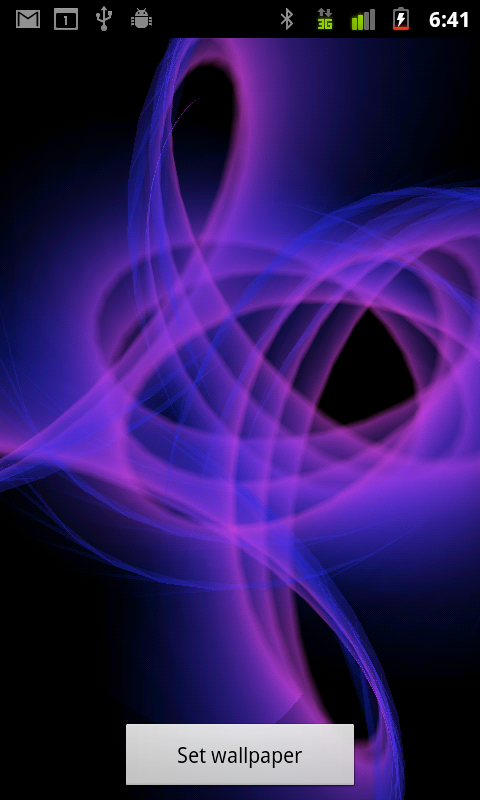 In Color Storm a fairly standard spiral pattern is combined with a particle processor to create a thick ribbon that changes thickness throughout its length. Shaded OpenGLES triangles are used and alpha values carefully tapered to give a smooth effect resembling a beam of light. I put a lot of work into the interpolation engine. This smoothly transitions through a range of pattern values in order to achieve a wide range of visual effects without jarring changes in speed. I deliberately made the progress slow in order to create a restful rather than frantic pace that may be distracting for users concentrating on their home screen widgets. I hope you enjoy the app! 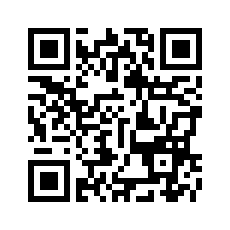 Search under Color Storm in the Market application, or use the barcode here (with Barcode Scanner or Google Goggles). Wikipedia is a fantastic resource. As well as a great encyclopedia, it is a gold mine of information placed in an organized structure. I’ve long been interested in how this could be exploited for applications beyond the encyclopedia; something which is allowed for in site’s Free Documentation license. It seemed to me that a general knowledge quiz would be a superb alternative use for the data, so I set about to make a Wikipedia quiz, or ‘Quizipedia’. Mining Wikipedia would result in an array of questions from geography, history, entertainment, sports and science; in fact across all areas of human endeavor and study across the globe. I decided the game would work best in a multiple choice format. The design I chose was to challenge the player to match ten random article names (on the left) against the subject description from the article (on the right). The first sentence of a Wikipedia article usually succinctly describes the subject of the article making it ideal for a quiz question. The player has sixty seconds to complete the task. The player is permitted to ‘pass’ a question, in which case the next question in rotation is shown. The pass mechanism is in part because the scraper is not perfect. I’d like to think it’s about 90% perfect, but weird or unfair questions can slip through. Allowing the player to pass these questions until they can be answered by elimination means the quiz is not ruined. The game is here and it is ready to play. However if you’d like to read about how I built it, read on. There are two parts to the web game. There is a client served using a GWT application served on Google App Engine. This requires a database of questions to work from. Selecting the best questions and effectively scraping them from Wikipedia was the tough part. Using the techniques I worked out for my earlier article I wrote a new scraper to crawl pages from Wikipedia. This was a Java client running on my workstation making HTTP requests and using an sgml processor and XPATH queries to pull out the relevant text. The rate of crawling is no more than 30 articles a minute, which is unlikely to be interpreted as an attack by the web server. Each page crawl extracts links from the article to used by further searches. It also extracts the opening sentence. All we have to do is strip the name of the article, leaving the reader to guess what is being referred to. Paris is the capital of France and the country's most populous city. ______ is the capital of France and the country's most populous city. The blanking process cannot always be completed. This is because the subject name does not always appear in full in the opening sentence. This means only about 60% of articles can be processed in this way. In order to maximize the chances of being able to successfully remove the article name from the opening sentence I consider all text strings used to link the article found in the crawl so far. For instance, an article may be linked with the term “United States” or “United States of America”. One problem I encountered early on was that there is a surprising number of articles on very obscure topics to be found on Wikipedia. Follow the ‘random article’ link and you’ll get a good idea of this. I was happy for the quiz to be about random topics from general knowledge. However to give players a fighting chance they shouldn’t be on topics that they had a reasonable chance of having heard of. A good signal is the number of ingoing links to the article, and also the number of outgoing links. The latter is the case because topics on popular subjects tend to be well-developed by many editors, and this translates into a lot of links going out. Fortunately both these metrics are available to me during the crawl, allowing me to discard smaller or not well-linked articles. The multiple choice aspect to the game demands feasible alternatives to each answer. Otherwise it can be obvious which is the correct answer by applying a process of elimination. For instance if the question pertains to a country with particular borders and there is only one country on the list of alternative answers, the correct answer is obvious. I wanted to include in each quiz a number of subjects that could reasonably be confused without close consideration of the question. So if the answer was ‘Paris’, the user may also be presented with ‘Lyon’ or ‘Brussels’. This was the most challenging part of the scraping process. I investigated a number of ways to discover for a given page typical alternative answers that could be presented. These included sharing a large proportion of incoming or outgoing links. The problem with this is the computation required to match link fingerprints globally – just a few hours of scraping accumulates 5 million links between pages. Fortunately a really good signal turned out to be when the links appear together in the same lists of tables in Wikipedia. There are a surprising number of lists to be found in Wikipedia articles, and they very frequently group articles together of similar type. Identifying where articles appear together in lists and ensuring it is likely that they will be placed together in quizzes makes the game tougher and hopefully more compelling. That’s a brief description on how I built Quizipedia. I hope you enjoy the game, and if you have observations or feedback please leave it on the comments of this page. The Android phone operating system provides close integration with three excellent services from Google; email, address book and calendar. In addition it has a thriving third party app scene with a great variety of free and commercial applications on the Market. In theory this should mean that apps can provide new services to the user based on the Google service data they have already synced on the phone. However in the case of calendar data this has proven a bit tricky. Google provide an API to access calendar data via the internet, and this can be used directly from Android apps. Unfortunately this also requires a working data connection, time and battery life to get at the data. In addition it will need the app to prompt for the user’s credentials (user name and password). All this seems unnecessary when the data you want is right there on the phone already. Since there is an API that any application can use to access the user’s contact (address book) data directly on the phone without going to the internet. It’s called android.provider.Contacts and is documented here. So why doesn’t android.provider.Calender exist? The answer is that is does exist – although it is not documented, and it is not included with the standard Google Android SDK. It is a little-known fact that it is possible to download the Android source, force the provider classes to be included by removing the @hide annotation that protects it, and make your own version of the SDK. This can be compiled against apps from which calendar queries can then be made. This is how I originally built my app Quick Calendar – a ‘lite’ read only version alternative to the built-in calendar application released early 2009. This uses the same data used by the built-in calendar application, already synced onto users’ Android phones. Judging by my inbox it’s been the most popular hobby application I’ve ever put out. I’ve since had a number of inquires from other developers as to how I managed get at the internal calendar data on Android. Firstly I would say that getting at the data by a custom-build SDK is possible but awkward. For one thing it is a pain keeping up to date with the latest changes and staying in sync with the Android Eclipse plug in. The good news is you don’t actually need to use the calendar provider SDK classes to get at the data. Android exposes data across applications by using a feed system similar to web-based feeds, and query syntax similar to SQL. As a result, provided your app has the correct user permission (android.permission.READ_CALENDAR) you can query the database from the names, and continue to use standard SDKs such as 1.5 or 1.6. In the absence of specific SDK support for calendars, it’s only slightly less convenient to directly use the provider’s internal URIs (e.g. “content://calendar/calendars”) directly. At this point I should point out that there’s a reason why Google haven’t officially exposed the internal calendar APIs. This is probably because they anticipate future changes to the calendar format. Once they’ve published an SDK the formats are to some extent set in stone and they’d like to avoid that. In my experience the formats have been stable since I first discovered the feed. However, don’t be surprised if future firmware changes break any apps that use the feed. In this event you’ll have to update your app and re-upload it to the Market. It’s not that big a worry, certainly not enough to avoid using this great feature – the ability to present users’ calendar data in new ways to them. I’ve uploaded an example project to http://svn.jimblackler.net/jimblackler/trunk/workspace/AndroidReadCalendarExample. All the calendar reading code is in http://svn.jimblackler.net/jimblackler/trunk/workspace/AndroidReadCalendarExample/src/net/jimblackler/readcalendar/Example.java. To read the calendar data in your own app firstly add android.permission.READ_CALENDAR under <manifest> in your application’s AndroidManifest.xml. Please note that you will probably have to use a real phone to test your app in development, because the emulator included with the SDK does not include the Google services (there will simply be no calendar database present to query). Once you have a calendar ID you can use your ContentResolver object to obtain the events from that calendar. Note how a ‘where’ clause of ‘Calendars._id=? ?’ is employed to fetch only events of that particular calendar. This clause could query whichever columns your app required, using an SQL-like syntax. Note also how the Uri.Builder was used to build up a URL including date bounds for the query. Note that all dates in the calendar format are stored as UTC (the number of milliseconds that have elapsed between midnight 1st January 1970 and the event in Greenwich UK). This is the basics of calendar access on Android. I haven’t covered all the columns (these can be seen in the SDK source linked above) and I haven’t covered modification. Notheless I hope this information allows other developers to build great calendar-aware apps for Android. Please do leave queries in the comments here, and if you use this information to make an app please do tell us about it in the comments here. To access the Corporate Calendar on Motorola devices, use “content://calendarEx” in place of “content://calendar”. 28th May 2011: BBC News is now UK & World News. Two years on, two million downloads later, same app, new name. I hope you all continue to enjoy reading the BBC News site through my app. 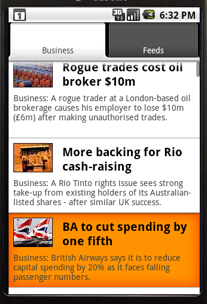 BBC News is a widget for Android for that shows you the latest news headlines in a compact 2 x 1 widget on the Android home screen. Clicking on the widget takes you to a full list of headlines and more story details. In the headline view, clicking on a headline will in turn take you to the mobile version of the BBC News page on your Android browser. 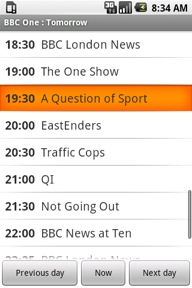 Each widget can be customised to show content from any of the BBC’s feeds. The default is the Most Popular feed, but users can choose others such as Sports headlines, Entertainment or Technology news. Android users outside the UK will see the international versions of feeds and stories. UK users will see the local version by default, although any user can switch between UK and international versions in the Preferences. You can have multiple widgets on your home screen. They will not normally show the same story, so if you set up three widgets from the same feed you will have the first, second and third headlines shown, in the order the widgets were added. This isn’t a general purpose feed reader. It is customised to the style of the excellent BBC News feeds to give the best experience. I saw some RSS widgets but they try to include too much text on the widget, and the result is hard to read. Also they did not use the thumbnails that accompany each story, losing the visual appeal that they add. Download BBC News from the Android market now. This program is free software under the Apache license. Supported by BBC Backstage. I hope you enjoy BBC News. As always, leave bugs and requests here. Even if you just enjoyed the app and would like to let me know. I read all comments but I have only around an hour a day for development so I usually can’t fulfil requests. I normally act when several people start asking for the same thing. Events Clock is an experimental visualisation for your Google Calendar. It shows your upcoming events as coloured slices around a traditional clock face. 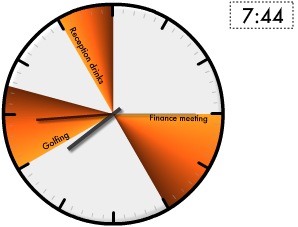 The visualisation shows where the hour hand on the clock will be when each event is in progress. The calendars shhown will match the your existing selection of visible Google Calendars. The colours are taken from the colour you have selected for each Google Calendar, with the exception of events in the past, which are shown in grey. If there is any doubt as to where the 12 hour period begins and ends, a dotted line is shown. Clicking on the events will send you to the page on google.com/calendar for that event. To view Events Clock as a stand alone web page, click here. If you don’t use Google Calendar, or don’t have any events in your calendar over the next ten hours or so, click here for a demo. 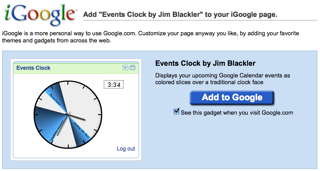 To add Events Clock as a gadget on your iGoogle page, click here. The idea came from the desire to see at a glance what I was supposed to be doing over the course of the day. The original idea was for a mobile phone application. However, once I’d developed a Flash prototype, I discovered iGoogle Gadgets, and the two seemed an ideal fit. I adapted the visual design for the smaller area and it seemed to work well. As an iGoogle gadget, you’ll see an instant pictorial representation of your day’s events whenever you navigate to your Google homepage. Events Clock uses a method called AuthSub. This enables it to get access to your Google Calendar data, with no possibility of access to anything else from your Google account. When you click to grant access, a new browser window is opened pointing at a page on Google.com. Here you can allow access to Events Clock. If you have to enter any passwords you are informing Google.com. My site will never see this information. It can’t even see your user name, or email address. All it gets is a token from Google that allows it access to your calendar data. This token is stored, encrypted, as a cookie in your browser. Note that the Google authorisation screen warns that Events Clock has not been configured for secure access. I have in fact developed secured access, but a possible bug in App Engine appears to be blocking the secure authorisation requests. I used Google’s new cloud computing platform App Engine to host Events Clock. This is possible now that App Engine supports Java. This allows my app to benefit from the scalable, and of course free, hosting. The development went reasonably smoothly, although there were some teething problems with the Google Data access. Events Clock is a concept application, so I’d be very interested to hear your feedback, or reports of technical issues. Please leave comments on here on this blog. 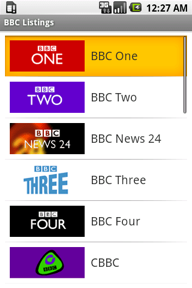 For Android phone owners in the UK, BBC Listings is a viewer and search assistant for the BBC’s TV and Radio schedules. Users select from a list of channels, then view the schedules for that channel, one day at a time. Clicking on a program shows you a synopsis, and allows you to add a reminder to your Google calendar. 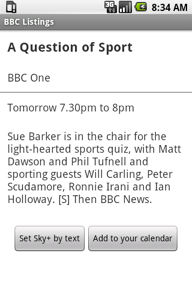 Sky+ users can set their Sky+ boxes to record BBC TV programs by a text message. Because it gets its data from the BBC’s web services, internet access is required. Currently, one week’s worth of future listings and one week’s worth of past listings are available. To search the listings press Menu and Search. Results are returned sorted by channel and then by date. 0.9.1 : The first published version. If you have any comments or queries about this application, please leave them on this blog. I’ve just released a simple utility QuickCalendar onto the Android Marketplace. It’s a simple application that displays the current and the next (or the next two) events on the notification bar of your Android phone. I wrote it because I miss a similar feature from my last phone, a Windows Mobile device. The trickiest part was getting access to the calendar data. There is a provider for calendar data, but unlike the contacts provider it is not part of the standard SDK. However the functionality can be obtained if you get the source (Android is open source), adjust the exported items and build your own SDK. I may write an article on how to do this if there is demand. Also I will release the source for the application when I have OKed it with my employer. In the meantime you can use the application yourself by going to the Android Marketplace on your phone and searching for QuickCalendar. I’ve had some nice comments and feature requests (always welcome). As a result I’ve fixed some bugs and added some features. Search button supported on devices that have a hardware search button. 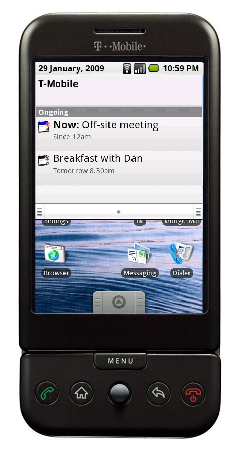 Corporate Calendar supported on Motorola handets. Widgets refresh immediately when calendar is modified, when preferences are modified, and when the screen is enabled. Progress indicator for main page. Widgets to not refresh when screen is off, to save battery. Refresh rate can be configured in preference screen. Bug fixed with widget font size. 0.9.18 : Cupcake version! Gadget for home page available. Colored indicators in task bar. Also: German language support. 0.9.17 : Bug fix release (service not starting on phone power up since 0.9.13). 0.9.16 : 24hr (aka military time) format not used in category view unless is on in phone preferences. 0.9.15 : Bug fix release (preference changes not taking effect). 0.9.14 : Context menu selection for time events. Day group headings correct in all time zones. 0.9.13 : Now possible to specify any time (up to 999 weeks) to look ahead for notifications and for the main event list. You are not limited to the pre-set durations. New notification icons more in keeping with the Android conventions. New choice of event list format of ‘grouped by day’ or the original classic layout. Events can be shown colored by the calendar color. 0.9.12 : Fixed bug introduced in 0.9.11 (time zones didn’t work). Sorry everyone. Daylight savings time should also work properly now though. 0.9.11 : Improved progress indicator. Attempted bug fix on calendar preference screen. 0.9.10 : Search option – now possible to search calendars! Minor cosmetic improvements. 0.9.9 : New icon from Darrel Austin. Another ‘all day’ event fix. Fixed problem with apk size. 0.9.8 : All day events sort correctly in all time zones. All day events future day names correct. 0.9.7 : Up two four alerts. All day events work in all time zones. 0.9.6 : aDogTrack support. Notification icons can be enabled in preferences. 0.9.5 : Less obtrusive notify icons. Start service on power on option. 0.9.4 : Ability to select/deselect calendars to alert (where you have multiple calendars). 0.9.3 : Fixed problem where the notifications stopped updating. 0.9.2 : Fixed problem where the time zone was ignored.